PAHBs can be derived from lignin, the second most abundant polymer on earth that is a low-value by-product of the paper pulping and cellulosic bio-ethanol industries. As fossil fuel supplies dwindle and as consumers increasingly demand environmentally friendly products, various companies have begun to commercialize sustainable or green polymers. The most successful bio-renewable synthetic plastic is poly(lactic acid) (PLA), which can be found in various packaging applications. However, drawbacks to PLA include: a limited functional temperature range; the utilization of a food source for its starting material (corn and other starches); and a reliance on batchwise fermentation technology for feedstock conversion. 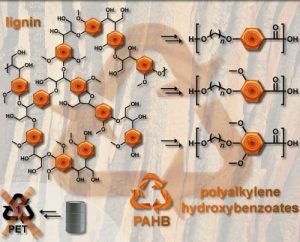 Stephen A. Miller and co-workers (University of Florida, Gainesville) now report polyalkylenehydroxybenzoates (PAHBs) derived from lignin, the second most abundant polymer on earth that is a low-value by-product of the paper pulping and cellulosic bio-ethanol industries. While avoiding complex fermentation routes, aromatic molecules abundantly available from lignin (p-hydroxybenzaldehyde, vanillin, and syringaldehyde) could be incorporated into PAHBs, affording polymers with an expanded useful temperature range. The thermal properties closely match and sometimes excel those of the widely popular polyethylene terephthalate (PET), which garners 18% of the worldwide plastics market in the form of films, fibers, and thermoplastics (such as water bottles). Additionally, the chemical resemblance of the PAHB materials to lignin should make them vastly more biodegradable and the degradation products should be much more appealing to microorganisms than petroleum-based building blocks, ensuring their ultimate decomposition into water and carbon dioxide. The PAHBs might even be programmed to be water-degradable; that is, degradation may occur in seawater, lakes, or the bottom of a landfill without the need for microorganism or composting activity. Future studies will focus on these degradation pathways, which could substantially ameliorate the trash crisis and the accumulation of plastics in our oceans.